The only thing sharper than her wit… Is her teeth! No, really. It says so, on the cover. In this reimagining of the young Jane Austen’s life, vampirekind enjoy lives of decadence and privilege at the height of English society. Jane is a young woman living in a small town, whose first novel (of two sisters, who always get along, and witty banter) has just received yet another rejection notice. At a social gathering, she meets – and is turned by – a cad of a vampire. Traveling to Bath with her family to be cured of the disease, her transformation back to wilting violet is halted by the invasion of the French. 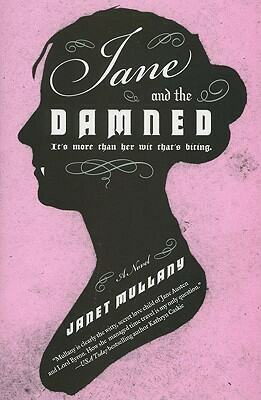 Less Pride and Prejudice and more of a generic everygirl story staged in Georgian England, Jane and the Damned settles comfortably into the category of “popcorn reading,” being lazily entertaining, moderately well-paced, and quite predictable. K.L. Gives Jane and the Damned 2.5 out of 5 French flags flying over London.